Whether you’re bored with your home or hoping to increase its value with home improvements, remodeling can not only renew your space, but it can also make every one of your rooms more functional. There are many reasons people renovate their homes. Some see the renovation as a short-term investment that will yield returns when they place their home on the market. Others see a home that almost matches their dream home, but lacks one or two features that they really want. 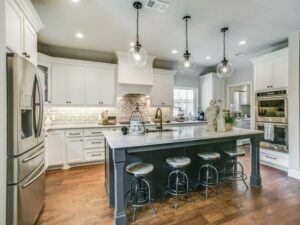 Most homeowners find that at some point, the desire to renovate stems from one of these reasons. Reasons People Renovate: Is it time to start your remodel? carpeting in the living room was an attractive addition in the 1980s, but those features are now more detrimental than valuable. An investment of just a few thousand dollars can reap bigger returns when you try to sell your home. 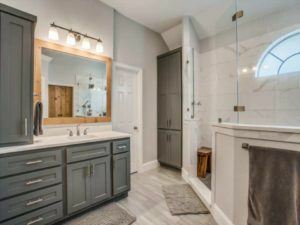 New light fixtures or the installation of large windows can return three to four times your investment, while a master bathroom expansion may return up to five times your money. If you want to complete some renovations to raise the value of your home, speak with an experienced design-build contractor before beginning any work. Most upgrades will increase the home’s value but you want to put your money where it will benefit the most. Selling your home and buying a new one can be stressful and time-consuming. Instead of spending time searching for that perfect home, take a look at your space and see what the possibilities might be. Our design-build team can help you understand what can be done. The exterior of your home is vital for raising the value and sales potential of your home. It’s amazing what fresh paint, clean shutters, a new roof, and landscaping can do. Here are a few simple ways you can enhance curb appeal if you’re looking to sell. Are you tired of using your attic as one big storage unit? Convert it into a living space, such as a media room, or even add a closet and a window for an extra bedroom, which will add square footage and increase the overall value of your home. Adding a room to your homes such as a theater space, a home office or even a laundry room are additional reasons people renovate their homes. When rearranging the home’s interior isn’t enough, it’s time to consider an addition. A room addition is often more affordable than you might think and it allows you to tailor the new space for a specific purpose. The bones and overall style of homes built in the 60’s, 70’s, and 80’s are popular choices for renovating today. However, you often have outdated plumbing, electrical work and safety features that are not up to current city codes. While it is not always required to bring these items up to code, it is definitely safer to tackle while renovating! Another of the reasons people renovate now may include more energy efficient options. Windows, doors, and even kitchen and bathroom faucets can be updated and provide major savings in money and energy. Adding new insulation to your attic area can help seal air leaks and improve your home’s heating and cooling costs. 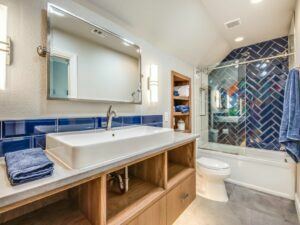 Your bathroom might be just fine, but it’s always a good time to put in new, more efficient plumbing, or get rid of that plain light fixture and replace it with a more modern one. If you’re planning on staying in your home and possibly adding aging parents, it’s important to consider upgrading your home with aging in place features. Simple changes like replacing your bathtubs with step-in showers with bars, installing toilets for people with limited mobility or in wheelchairs or widening doorways as you remodel. Adding a room for an aging parent tops the list of reasons people renovate homes they love. Aging parents often require some supervision but they also need to enjoy some privacy and freedom. Read more in our article about multi-generational living. The kitchen is the heart of your home, especially during the holidays. Family and friends gather and spend a lot of time here. Consider installing a new stove, replacing your refrigerator or putting in new cabinets and countertops to make it more functional for your season of life. As your family grows, so do your family’s need for space and the current layout may no longer meet your needs. Children grow older and want their own rooms, you start cooking more meals at home and need a kitchen island or you realize a Jacuzzi tub in your bathroom would provide the perfect getaway. The need to change the home’s layout is one of the chief reasons people renovate. You maintain the “bones” of the home and rearrange interior walls to fit your vision. The renovation can be as large as stripping the home to the studs, or as small as knocking out a wall or adding a door. The only limits are your imagination and the size of the interior. Many families don’t want to leave the area that they are in. Friends, family, schools, church. However, their home just isn’t working for them. Don’t wait to remodel, make your home suitable for your family and the future now. Need help financing your home improvement project? DFW Improved offers some great options for customers who prefer to finance their remodeling project, made possible by Greensky Financial. Subject to credit approval. Is a full remodel not a possibility? Maybe the bones of your home are almost perfect but it needs a minor facelift. Replacing your flooring or painting your walls and trim can help it to instantly feel fresh and clean. Long, dry summer days in Texas create the perfect conditions for starting your home renovation project. Whether you just want to give your home a quick update to make it feel more modern or you require a complete interior and or exterior redesign, starting your project now means it will be finished in time to show off during the holiday season.